I guess she thinks I’m dead. I could clear my head. I’ve got a tangled mind. In Exhuming Bob 31c I said I was waiting for a copy of Al Aronowitz’s book Bob Dylan And The Beatles. It arrived and I read it. 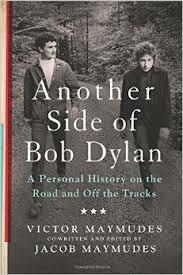 Like Victor’s book it is a first hand account of Dylan. Strangely, or perhaps not so strangely, Al like Victor wanted to be Bob. Dylan epitomized their hopes and vision of themselves. Couldn’t be improved on. However not being Bob the next best thing was to be as close to being his shadow as possible. 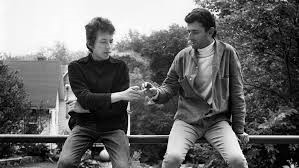 Amazingly, or perhaps not so amazingly, both men were glorifying Dylan at the same time during those magic years of the Sixties Bob. Al once asked Bob why he wanted to perform. Bob replied simply: I want to be exalted. There may be a key to Dylan. He wants you and I, the country, the whole world to make him feel exalted and he achieved that goal in spades. In that context one can only imagine how crushed Bob’s feelings must have been when he was booed and booed and booed when he went electric in 1965. No exaltation there. As a side note Murray The K in his book says that one reason Dylan was booed, especially at Forest Hills was because he was switching to rock and roll which the folkies considered pimple music. Murray who MC’d part of the show was also booed but because he was considered a bubble gum disc jockey. So Dylan was perceived as switching from serious folk to teeny bopper rock n’ roll. It must have been a period of profound fear that perhaps he would be rejected and never be exalted again. It must have been quite similar to when he did his Little Richard act during assembly to an uncomprehending student body and faculty back in Hibbing. The principal wanted to pull his plug that day just as Alan Lomax would want to take an axe to the cables in ’65. Bob persevered, overcame resistance, or elected a new body of fans, and then crashed in ’66 from the strain. He laboriously and falteringly rebuilt his career after ’66. And this is important, he would make his audience exalt him no matter what he did. I saw his October ’14 Portland show and he had taken electricity to a new level of voltage. I would have said he took electricity out of Arkansas but I don’t know how many have heard or remember Black Oak Arkansas’ When Electricity Came to Arkansas. Dylan remembered it because his sound was close to lifted from that performance; spectacular for the early seventies. Dylan’s show was fabulous; perhaps the finest rock show I’ve ever seen. The band was the thing. Dylan’s performance truly being peripheral. He no longer sings per se but gargles along in tune with the band; if you catch his drift not bad at all. As a composer and conductor is where he excels. Bob however has been in pain all his life. He acquired a tangled mind, tangled up in blue. Never a fashion plate, for the show he came out in some godawful gauche and need I say outre version of a Southern planter’s suit while he acted as though we of the audience were slaves on his plantation down in Dixie. As is well known Bob studied the Southern plantation systems in the New York City public library while he was waiting for stardom to strike him. Apparently he learned his lessons well. So, I’m from Dixie too. I got it. Although from a distance he looks pretty frail he stood at the mike and in front of a wall of sound that Phil Spector would have envied lectured us on how he wasn’t as stupid as us living humdrum lives, the very idea of which he had renounced from the first time he heard Accentuate The Positive on the radio before he could walk. Something happened along the way as Bob hasn’t accentuated the positive since he was five. Perhaps Victor and Al had also been slapped down hard along the way becoming those of the ‘abused, misused, strung out one’s or worse’ Bob materializes in his song The Chimes Of Freedom. Back in the old days he says that was the audience he was reaching for and that’s the audience he got. It was that appeal that brought the ones who felt abused and misused into his sphere. Either I outgrew the feeling or Bob left the hall in ’66 for another show. He forgot about us after that. Victor and Al, as I say, obviously knew the feeling, bonding to Dylan like a Siamese twin. Al, by the way, corroborates everything Victor said. He really did say into a tape recorder rather than write in text. So in Chapter five Victor relates how he and Bob turned on the world. Victor must have been sidelined after the August ’65 meeting with the Beatles because the period from August ’65 through the ’66 motor bike accident he merely summarizes his relationship few details. No mention of Andy Warhol, Edie Sedgwick or even Bobby Neuwirth. Nothing about the ’66 tour on which he was the road manager. In point of fact after picking up Neuwirth in SF Bobby replaced Victor as Bob’s sidekick and confidant. It was the arrival of Neuwirth that completed the fearsome putdown act of him, Dylan and Grossman. I’d be a legend in my own time. In his way then his relationship to Dylan was the same as Victor’s and Al’s. Neuwirth could see or sense that Dylan would get the gold statuettes, be a legend in his own time, tears and regrets Bobby’s lot. Dylan had the ego and the drive. Neuwirth had the fear of success (there’s no success like failure and failure’s no success at all, perhaps that line of Dylan’s was written with Neuwirth in mind) or perhaps as accurately, fear of failure. Probably also he realized he would never equal or surpass Dylan. Paralyzed his will. While Bob could and would realize his dream of success Neuwirth could never have been able to measure up to that. Like Victor and Al then Neuwirth lived his fantasy through Bob. There was no place for Neuwirth in Bob’s life after the ’66 accident so he drifted off doing other people. According to Al he drifted around attaching himself to people with money. Al admired him greatly, considering him much hipper than Dylan. His account, his thumbnail of Bobby, is really worth reading. Al has been neglected as a source by the biographers but both his own career and account are significant Not a lot of copies of his book around though, mine came with Al’s autograph although made out Michael Gross whoever he may be. So, during this crucial year in Bob’s life Victor seems to have been marginalized but he still makes himself central to Bob’s life showing him how to be cool. Bob and I searched for an identity in the clothes that we bought; granted, it was only after Bob started to have an income that we really dove into fashion. He and I would go shopping at thrift stores together, searching for new identities when the one we were using started to get picked up by those around us. This cat-and-mouse game pushed us to wear increasingly outre clothes. We would try on every odd ball outfit we could find, trying to stay one step ahead of our social group. On tours around the country, we would seek out the salvage clothing stores and pick out the wild stuff. I found polka-dot shirts with Bob, and I made that a big deal. Polka-dots would become our contribution to the fashion of the sixties I look back on it now and I think it’s pretty funny how ridiculous we looked and how everyone around us took us so seriously. Bob and I shared this together, but I didn’t have the spotlight on me the whole time as he did. Note he heavy use of I, we, us. Sounds like they were joined at the hip with Victor in control guiding Dylan on the path to higher achievement. Al wanted to be Bob and in his way so did Victor but they chose different paths. Probably because Victor was six years older he assumed what is really a patronizing attitude. Must have irritated Bob. In this year covering mid ’65 to ’66 then Dylan had three intense buddy associates to deal with, Victor Al and Bobby, all three of varying types of servility. Of the three Aronowitz would last the longest while Victory and Bobby were followed by Robbie Robertson, who, by the way was born Jaime Robert Klegerman. He was the son of a Jewish father and a Mohawk mother, an interesting combination. Bob treated these guys quite contemptibly. Both Victor and Al have very bitter memories and both were dismissed in the rudest of manners. I don’t know the situation with Robertson but I imagine he and Bob aren’t talking either. I called Albert the “brain” based on the fact that he looked like a potato and the only muscle he used was his brain. For me, he was a very powerful person. I respected him like my big brother. But we had our issues because I would tell Bob the truth, about anything. Even if it was just my hunch someone was trying to manipulate him I would make sure Bob was aware of what was going on. Albert felt threatened by my transparency, and my criticism of his management. And then Victor says he clued Dylan to how Grossman was appropriating revenues from song rights. Little wonder that Grossman felt threatened or any surprise he fired Victor after the accident thus ending that relationship for several years. If we are to believe Victor about this first phase of Dylan’s career he was the guiding light for Dylan. Thus he makes it sound as though he nearly was the author of Dylan’s success. He wouldn’t have been Bob without Victor by his telling. Nevertheless Bob always came out on top and Victor, Al and Bobby and Grossman were left in the dust. Bob began his career with a tangled mind, beginning his second phase in the same mental state.